The Tipestry is a blockchain based social network project. Tipestry aims to integrate user tipping, allowing anyone to earn money for posting good content. It’s also the first platform in history to enable universal website cryptocurrency donating, allowing people to support content creators without dealing with banks or credit cards, giving up personal information, or paying high fees. Tipestry adds a meta layer to the Internet allowing users to interact and earn cryptocurrency anywhere online. First is that the prevailing business model for social media platforms is to sell their users’ personal information to third parties, usually without the users understanding what they are giving up in terms of privacy and security. Second is the difficulty for content creators to benefit financially from their work, which is partially responsible for an overall decline in journalistic standards and the proliferation of clickbait content. Third is the trend for large companies to push agendas – both commercial and political – by censoring or completely disabling user feedback on their sites. Another goal of this project is to provide new uses for cryptocurrency and to put coins in more people’s hands without requiring an understanding of the technical details. We believe that seamless tipping, in particular, presents a natural introduction to digital currencies and will help spread adoption. The main component of the platform is Tipestry.com, the web-based version which entered alpha testing in 2017. It is a web portal that effectively adds a comment section to any website where people can tip posts and donate to the site being discussed. The companion app Tipestry Go began development and entered testing in 2017. Tipestry Go is an augmented reality app that lets users leave comments at specific physical locations and search for digital coins hidden throughout the world. The Tippening, a site for voters to help shape platform policy and elect or remove moderators, is scheduled for release in early 2019. Find out what people are saying about a particular website. Is the site legitimate – is it a phishing scam, is its information up to date, is it fake news?, etc. Discuss sites where the comment sections have been removed. Many major news organizationshave removed their comment sections in recent years. Comment without signing up for a new account for every site. Signup on Tipestry.com requires only an email address and password, does not require submitting any personal information, and lets you comment on millions of sites. Discuss topics where there’s no obvious place to do so. For example, if I wanted to share mythoughts on rutabagas, but there’s no message board dedicated to that subject in my language, I can enter www.rutabagas.com on Tipestry and talk about it there. Discuss very specific topics. For example, after watching a movie, TV episode, or a specific song you on Tipestry can discuss it. Find and share information about new product releases. Going to that product’s homepage through Tipestry is a way to find the latest and most relevant discussion. 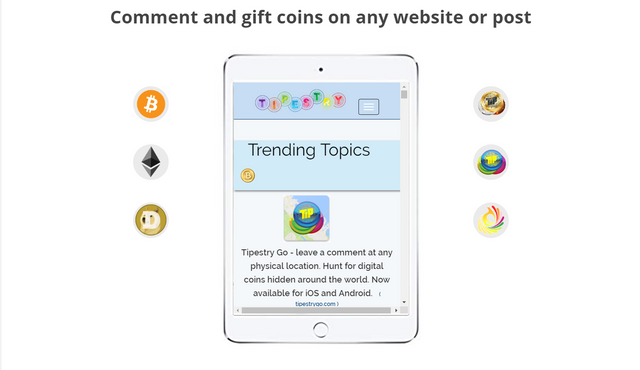 Tipestry also lets users tip each other and donate cryptocurrency to website owners. The purpose of post tipping is to provide a way for users to earn rewards for the value they create. This not only provides an incentive to post good content, but it also is fairer than the traditional model where only the platform owners reap the rewards of the content created by its users. Social media is only as valuable as the users make it, so those users ought to benefit from their contributions. 50% of the Tipestry Tokens will be sold in the token sale. 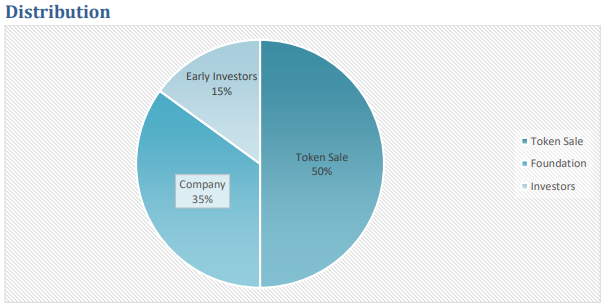 35% will be kept by the company and 15% sold to early investors and awarded to founders. The token sale will have a soft cap of $1,000,000 USD and a hard cap of $20,000,000 USD.